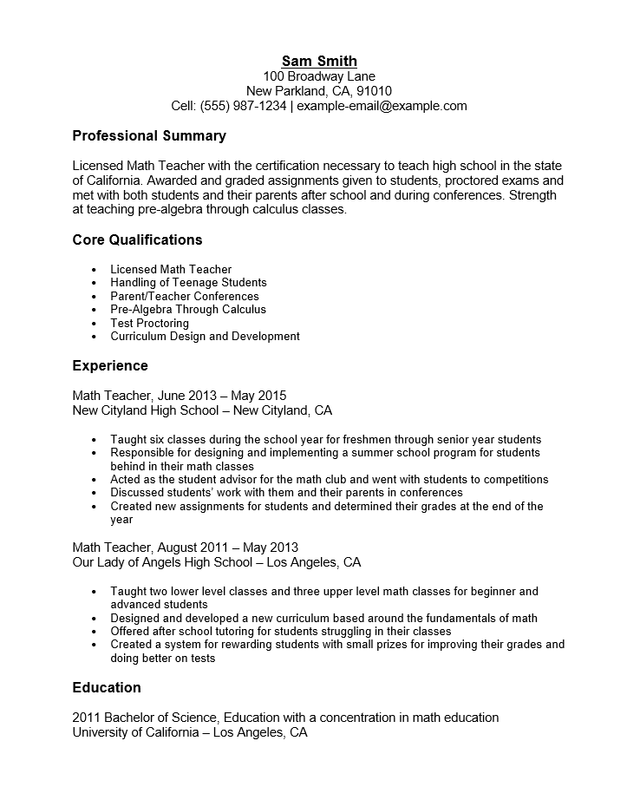 The Math Teacher Resume Template is an easy to use document divided into several sections that job hunting math teachers will need to include on a resume. These individual sections should be filled out with high quality content. This means the job seeker should take the time to write each section with resume buzzwords, technical jargon, and should display an impressive vocabulary. It is important to remember to be concise and to the point. 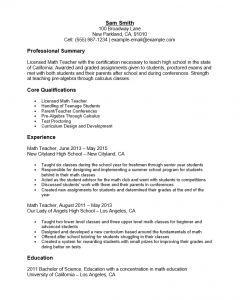 Math teachers will need to report on their educational credentials and their qualifications for the position they are applying for. Whenever possible, they should display a firm grasp on the skills it takes to teach the subject specifically through the content being written. This will greatly increase a candidate’s likelihood of achieving a resume’s goal of scoring an in-person interview. The sample below is for an experienced mid-level math teacher however, it may be used both by beginners and by advanced level professionals. If the user is a beginner they should keep in mind that a beginner’s resume in this field should really be only about a page in length. Advanced professionals may expand beyond this but are encouraged to be as straightforward as possible when composing each section. Step 1. Enter your full name on the first line and your contact information on the following lines. This may be aligned according to preference however, your name must remain at the top of the page. Step 2. Write a few lines about your professional identity under the “Professional Summary.” Be complimentary regarding your skills and experience. Step 3. Make a list of previous experiences that directly contribute to the position you are applying for. Put this in a Bullet format and place it under the “Core Qualifications” heading. Step 4. The “Experience” section will be composed of a list of entries you write. Each entry will be a position you held in a place of employment. This history should be written in descending chronological order. Each entry should begin with the position you held and the date range you held it for. The second line should be the name of the employer and the city and state where it is located. The rest of the entry will be a list of duties and/or highlights of your experience there. Step 5. Report the degrees you earned and any relevant information to the “Education section. The first line should be the degree title and specifics to be mentioned, if any. This is to be followed by the name of the school and the city and state it is located in.